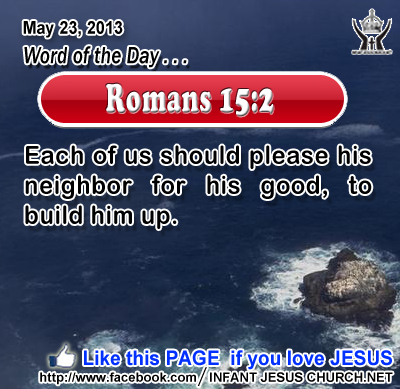 Romans 15:2 Each of us should please his neighbor for his good, to build him up. Heavenly Father, help us see the brokenness, hurt, and difficulties in the lives around us. Please use us to bless others who very much need to experience your love and grace. In Infant Jesus' name we pray. Amen. 41For truly, I say to you, whoever gives you a cup of water to drink because you bear the name of Christ, will by no means lose his reward. 42"Whoever causes one of these little ones who believe in me to sin, it would be better for him if a great millstone were hung round his neck and he were thrown into the sea. 43And if your hand causes you to sin, cut it off; it is better for you to enter life maimed than with two hands to go to hell, to the unquenchable fire. 45And if your foot causes you to sin, cut it off; it is better for you to enter life lame than with two feet to be thrown into hell. 47And if your eye causes you to sin, pluck it out; it is better for you to enter the kingdom of God with one eye than with two eyes to be thrown into hell, 48where their worm does not die, and the fire is not quenched. 49 For every one will be salted with fire. 50 Salt is good; but if the salt has lost its saltness, how will you season it? Have salt in yourselves, and be at peace with one another." Jesus used the image of salt to explain how his disciples are to live in the world. As salt purifies, preserves, and produces rich flavor, so the disciple of Jesus must be salt in the world of human society to purify, preserve, and bring the flavor of God's kingdom of virtue, peace, and compassion. What did Jesus mean by the expression "salted with fire" and "salt becoming saltless"? Salt in the very old world was often put in ovens to intensify the heat. When the salt was burned off and no longer useful it was thrown out on the pathway where it would easily get trodden upon. Perhaps Jesus wanted to contrast useful salt and salt which lost its aptitude to prevent dishonesty to encourage his disciples to bring the rich flavor of Christ's love, holiness, and virtue to a world dominated by greed, selfish ambition, and neglect for the weak, poor, and weak. Paul the Apostle reminds us that we are called to be "the aroma of Jesus to God between those who are being saved and among those who are perishing, to one a perfume from death to death, to the other a fragrance from life to life". Loving Infant Jesus, fill us with the fragrance of your love and truth that we may radiate the joy and peace of the gospel wherever we go and with whomever we meet.